I successfully grew some bamboo from seeds and it was really rewarding. Some were collected seeds from my own plant, some seeds for sale online that I bought, and some were sent to me through my bamboo society membership seed sharing. The seeds are supposed to be generally easy to germinate if sown as soon as they are collected. If stored seed, as with many other plant seeds that have been in storage and hardened off, they may need some time in cold temperatures for the purpose of breaking dormancy. 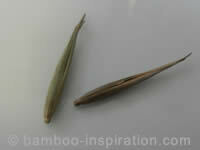 So if you do obtain any seeds you will need to be aware of when they were collected, particularly in the case of bamboo as they produce seed very rarely. To break seed dormancy you can either put the seeds in a refrigerator for a few weeks before you sow them, or you can plant them outside during the colder winter period and hope they germinate in the spring, although this last option will be a bit hit and miss. Consider your climate and the individual species before sowing the seeds outside in the winter. You're not going to be able to regulate the temperature for germination, or ensure they don't get completely soggy and rot. It's a better option to be in control of the climatic conditions to achieve success with bamboo seed germination, as is with many other plants. Particularly if the species originates from a warmer climate and a higher germination temperature would be needed. I have been reading reports of seed selling as being a scam, and that it is unlikely you are being shown a photograph of the parent plant along with the promotion of the seed for sale. Also that the resulting plant can be extremely varied anyway, particularly if gathered from the wild where open pollination between species may have taken place. 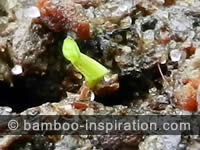 If you are going to buy bamboo seeds, try to obtain them from a reputable source. Also check the law for transferring seeds between different countries as the laws for seeds are generally the same as those for live plants and they may be confiscated at the border. The following steps are how I germinated bamboo seeds last year with a success rate at around 75 per cent; the seedlings have all survived through the winter indoors and are now ready to pot on. I used two different growing mediums last year. One with a general purpose peat based compost that I put through a sieve to get any big lumps out, and mixed 50/50 with sand. (Keep the big lumps for later on when you pot seedlings on, they will help with drainage). The other was using peat free compost just as it came out of the bag, and it was quite coarse. I had the same results from both growing mediums. You can buy purpose made seed compost if you would rather do it that way. I am going to try a topsoil mix this year and will post the results once known. While your seeds are soaking through the next stage you can prepare and warm up the growing medium, so get it ready first. Soak the seeds in water for 24 hours to start to soften them up. This process also helps judge the viability of seeds because those that float are probably not viable. A viable seed will normally sink to the bottom of the water. It’s up to you if you want to try the floating seeds as well or not. I just put my floaters in a pot altogether and none of them germinated so I guess the theory is pretty much correct. 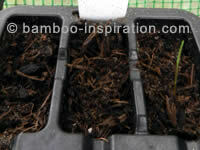 Use a seed tray or very small pots for the bamboo seed germination process. Put a layer of growing medium into the tray; leave enough room for a layer on top of the seeds, about half an inch. Place in a warm place for 24 hours to raise the temperature of the compost ready for planting the seeds the following day. Placing plastic over the tray should help keep it warm. Germination temperature should be at between 20 and 26 centigrade. Place the seeds on top of the compost around 2 inches apart so their roots don’t get tangled up. There will then be an inch on each side of each shoot when they appear. Cover the seeds with a fine layer of around quarter inch compost; this is where the sieving comes in handy as you don’t want big lumps of compost on top of tiny seeds. Don’t put too much compost on top. If you imagine these seeds in their natural environment they would just drop to the ground, they would not be buried under piles of heavy compost. Bamboo is a grass and grass seeds usually geminate successfully on top of compost but I like to put a small amount on top just as a bit of protection when the seed starts growing and to ensure they do not dry out. Place the tray in a warm place, in a plastic bag or covered by something that will retain moisture along with letting air circulate. 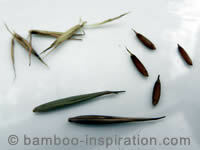 Different bamboo species seeds germinate at different lengths of time; there are no hard and fast rules. It does generally take around 30 days but may take shorter or longer. So don’t throw out the seeds unless you are sure there is no likelihood of germination.